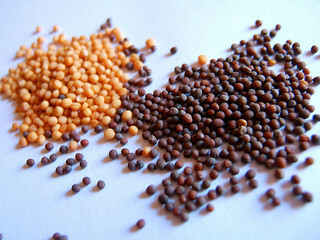 Mustard seeds, which come in black, brown, and white, help to protect against gastrointestinal cancers. They also provide anti-inflammatory effects as a result of their magnesium and selenium content, which may help to lessen the symptoms of inflammatory conditions such as asthma and arthritis. Mustard seeds are a source of omega-3 fatty acids, iron, zinc, calcium, manganese, niacin, dietary fiber, and protein, all critical nutrients for good health. Spreads prepared from mustard seeds cover a wide array of flavours and range from hot to relatively mild. They are good with red meat, in dipping sauces and marinades, on hamburgers and hot dogs, with pretzels and bratwurst, and in sandwiches and salad dressings. A combination of honey and mustard makes a nice glaze for salmon, pork, or poultry. Whole mustard seeds are often used in Indian cooking, and there are plenty of recipes online for those who want to cook with whole seeds rather than spreads or ground powders. When used whole, mustard seeds are typically fried in clarified butter (ghee) or oil before adding them to the other ingredients in the dish. Goitrogens in mustard seeds may interfere with thyroid gland functioning, so those who have thyroid problems should avoid this spice.